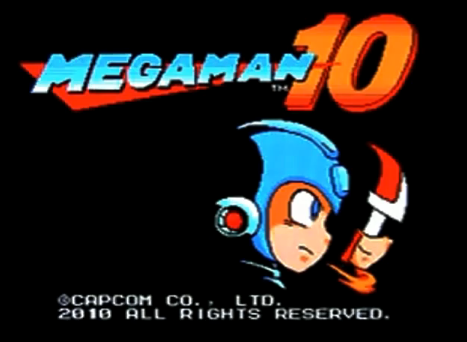 On March 1st, Capcom released Mega Man 10 on the Wii Virtual Console. As a few of you know, I've been playing Mega Man games since before I knew how to read, so of course I downloaded this game. As of now, I've only defeated the eight robot masters, so I haven't completed the game per se, but I'd like to give you my impressions so far. Please note that the following review may contain spoilers. Viewer discretion is advised. 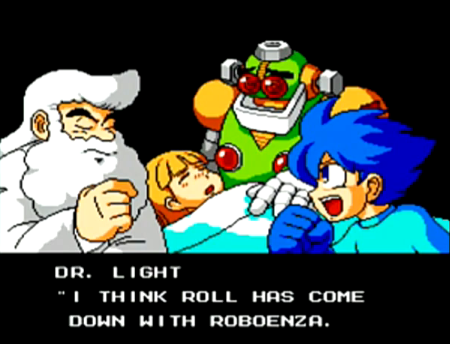 As the opening cinematic informs us, there is an outbreak of a robot illness called Roboenza that's making the world's robots ill. One of those who get infected is Mega Man's sister, Roll. Wait a second... Roll is... PLOT RELEVANT? 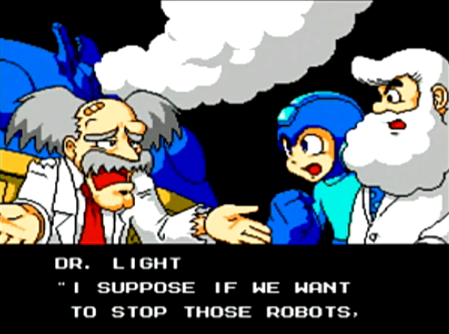 *sighs* Anyway, Mega Man rushes off to find the robot masters who "stole" Dr. Wily's medicine machine. And thus, the game begins. 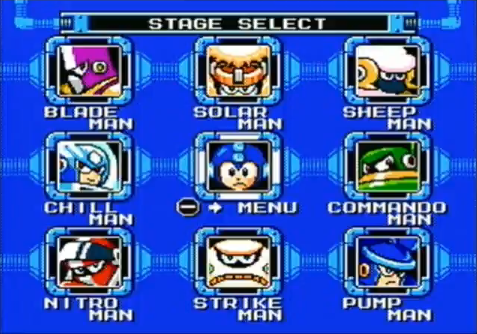 I would list off the robot masters, but I think that would be insulting to everyone's intelligence. For anyone who is interested in what boss is weak against what, I have a chart that I will post at the end of this article (as to avoid too many spoilers). The levels themselves are challenging, but not so quite as soul crushingly awful as Mega Man 9. In addition, Mega Man 10 offers an "Easy Mode" so if you're not to familiar with the game, it makes it a lot more manageable. Easy Mode makes enemies take few hits to destroy, Nerfs the robot masters, and covers up death traps. Unlike Mega Man 9, 10 tries hard to be its own game. In 9, we often heard music or sounds directly taken from previous installments (in 9's case, it borrow heavily from 2 & 3). 10 seems to try and be its own thing with more original sound, sprites, and music, which is greatly appreciated. Nitro Man is supposed to be a fast character, so his music should reflect his speed. However, this song honestly sounds like somethings that would belong to a night themed boss. True, his level is set at night, but it doesn't seem to fit, you know? Commando Man's stage seems to work a little better for me, though I can't really explain why. His level is in a desert (wait, did they get politics in my Mega Man? Grrrrr...) and his theme seems to relay a hot push through a sandstorm. Despite my complaints so far, I am enjoying this game quite a bit. I'll hold off my full judgment until I actually beat the game, but so far it seems like it was worth the $10. More to come once I finish. This is technically the end of the review. 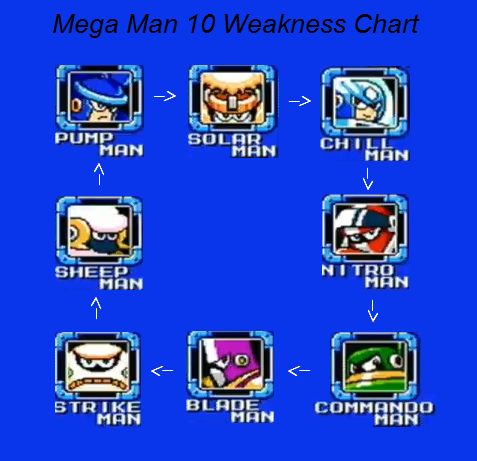 If you do not want to see the "Robot Master Weakness Chart," do not read any further. For the most part, you can figure out who's weak against what if you use the "Pokemon" school of weakness thought process. Roll: plot relevant, still useless.